# Boil the potatoes, peel, cut into hazelnut sized pieces. 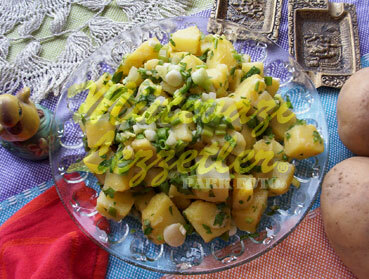 # Add finely sliced green onions, parsley and mix. # Put the olive oil, lemon juice and salt into a deep bowl and whisk. # Pour this mixture all over the potatoes. # Finally sprinkle the cumin, and mix without mashing the potatoes. # Rest it for about 1-2 hours, and then serve. Note: you can prepare this salad by frying the potatoes instead of boiling them, you should decrease the measurement of the olive oil in that case.